I’m finally ready to start showing off some of the projects that we’ve been working on since we moved into the new house. The house was built in 1996, but fortunately most of the house had been recently updated so there isn’t too much for us to do. Which is a great thing considering I have a two year old who consumes a lot of time and energy in my life. The biggest thing we’ve done so far is to have a few rooms painted. The half bathroom was the one that I was itching to paint the minute we moved into the house. 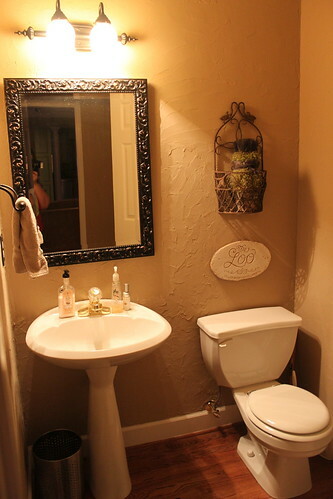 Of course I don’t have any good “Before” photo of the half bathroom, but let me just say twasn’t good. I’m thinking that back in the late 90’s when the house was built somebody didn’t do a very good job of putting up some wallpaper. When someone else decided to rip down that wallpaper, they took down some pieces of drywall with it. So to patch up that goof-up, they smeared mud all over the walls then painted it a high gloss greenish beige color, THEN they put a high gloss brown glaze on top of that. And the end result resembled something I’ve seen in one of Garrett’s diapers. This is not something I want to look at in any room of my house, ESPECIALLY in the bathroom. I do have a “During” shot for you so you can get the gist of what it looked like. 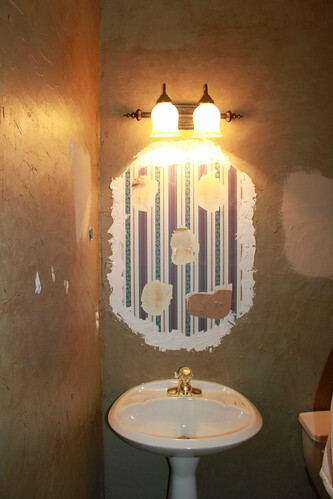 This was after the painters had removed the 90’s octagonal beveled mirror off the wall. Lovely! So, we had our friend Randy the painter come in and paint the walls with some leftover Sherwin Williams Latte from our old house. The key here was using a FLAT paint to minimize the mud. Any sheen at all just accentuates it. I know some people really love the smeared look. But me? I tried to de-emphasize it as much as possible. The flat paint really handled that well. It kinda makes me crave Taco Bell, but that’s better than it was before. Coming up next… the master bedroom! « The real reason Bella didn’t choose Jacob. Much better! Love the mirror too!